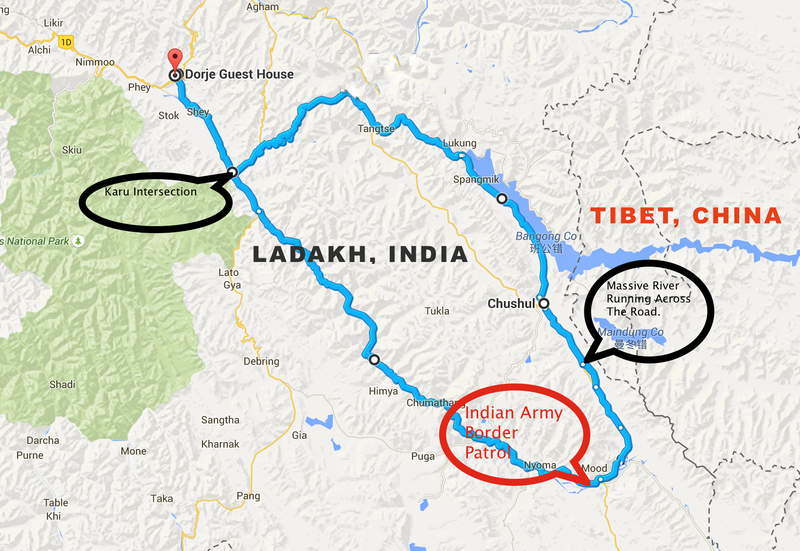 Closer To Indo-Tibetan Border. - Travel Soul Therapy Blog. Today I dedicated a whole day for one thing only. That is to dive headlong into a pool of Indian Tourism Bureaucracy. 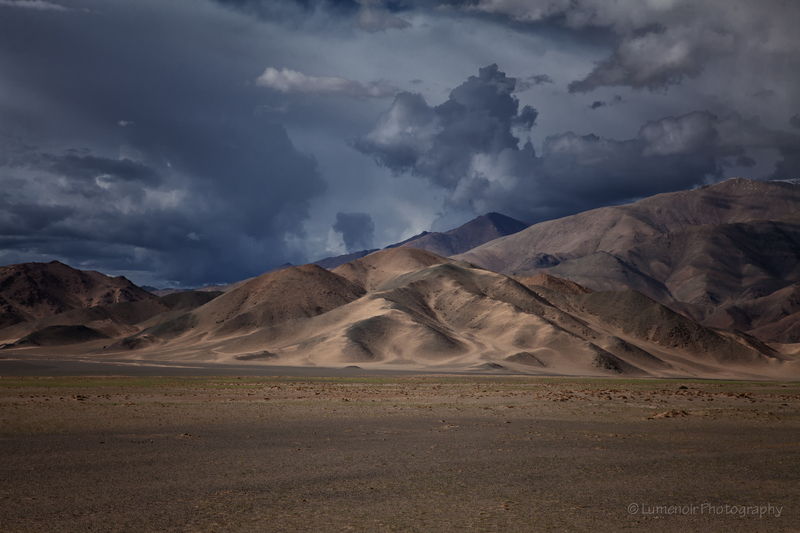 I wanted to obtain official dispensation that would let me and my group to go beyond Loma settlement in the Eastern part of Ladakh and traverse the area called Mood (Mudth). 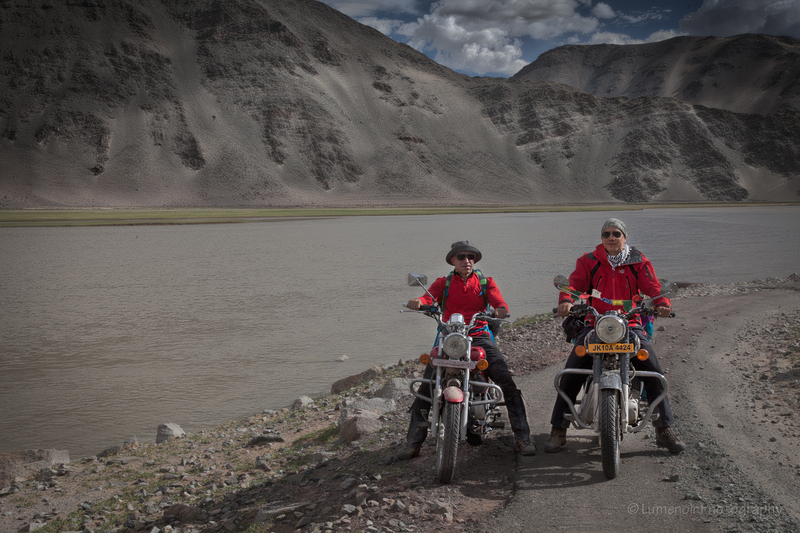 The idea was then to link to the pristine marvel of high-altitude Tso Pangong and return to Leh by the usual route via Chang La pass. It would save us a serious time to link these two routes regulated by two separate permits. That is the territory that is dissected by Indo-Tibetan border and there is often a flare up in an ongoing national chest-drumming cross-border skirmishes with China. Therefore foreigners are require additional clearance. After two phone calls made by the Ladakh Yeti Travels office which ended with “not possible”, I went to the Commissioner’s Office in person. With all my attempts I just found out that I needed to go Delhi to attain such exclusion. So I decided to pay 600 rupees per person for each separate permit and take a chance. 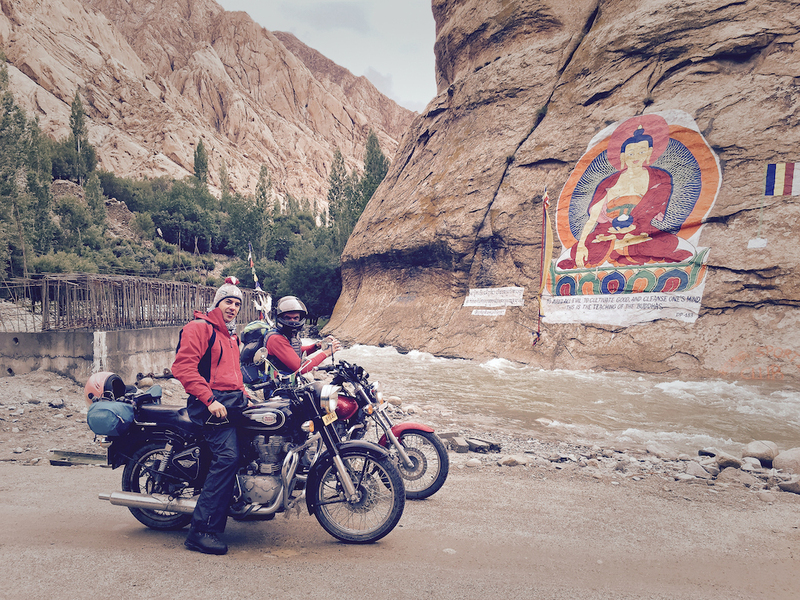 That means potentially spend an extra day to return from Loma to the Karu intersection and take a regular route to Pangong Lake if we are not allowed to ride along the border. Rainy weather draw a curtain of rain around Leh for days. 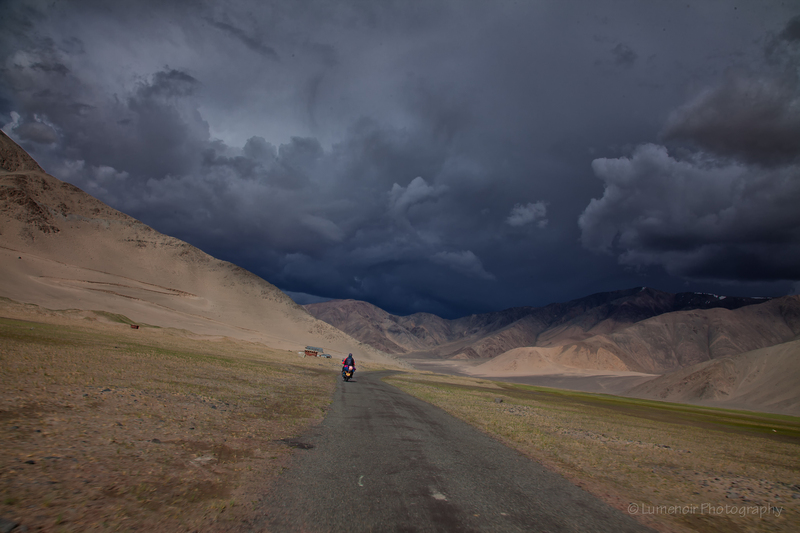 The Ladakhi natives don’t remember ever having such pattern of wet monsoon weather persisting above high altitude valleys. Our iron horses were set tonight and right before we went to sleep, we heard a rumor about road blockades by local taxi drivers tomorrow. We were told to leave town before six. Come morning we hit the road by 5:45. The streets were empty with occasional cars darting quickly with the same intention to avoid impending lockdown. 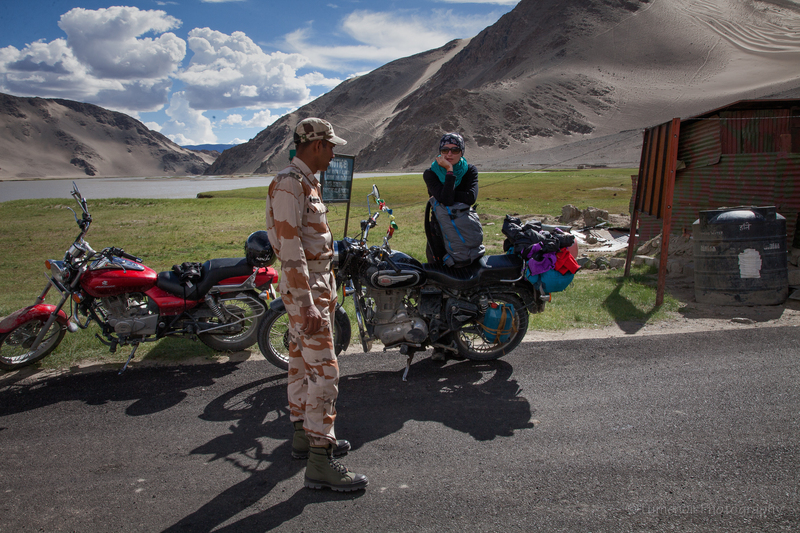 We run into first blockade about 20 km outside Leh right on top of a sharp curve. The vans were set up to stitch the road shut with a little slot left between them for those who man the roadblock. We were signaled to stop, but we didn’t want to be held illegally and made a disobedient maneuver and bolted screeching through the narrow slot between the cars. We didn’t plan for it, but made a clean escape. 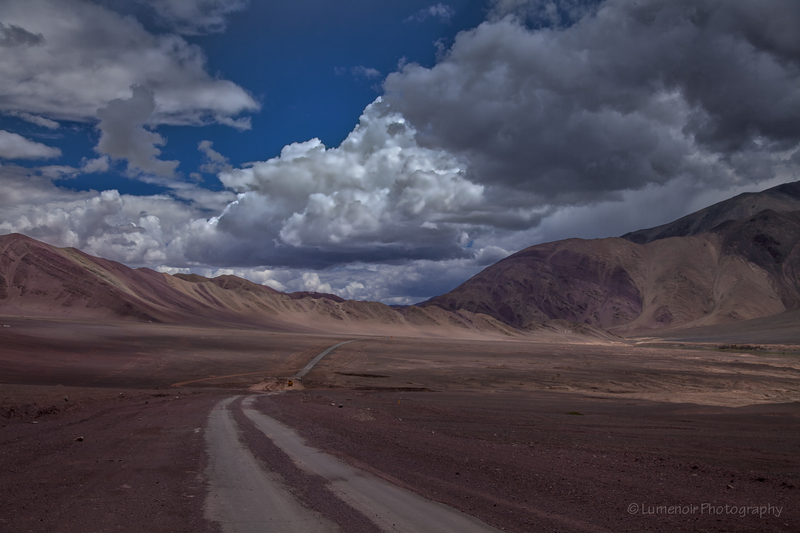 The seduction and delight of an empty freshly washed road just added more beats to the already jumping heart. No Tata trucks delivering the petrol and all the commerce, not even Indian army convoys – only us racing atop of a narrow strip of wet tarmac. Right after passing still empty military settlement Karu, where regular route to Pangong splits off our course turned parallel Indus River towards Manali. 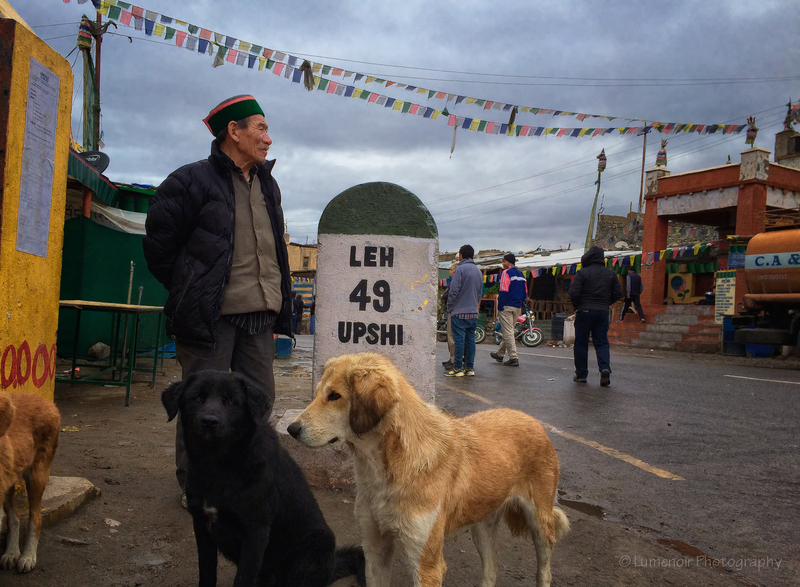 After outmaneuvering another makeshift road block that looked like a gang with sticks we arrived to Upshi — another major intersection. There was a fairly large crowd of domestic tourists and westerners outlined by a stream of Tata trucks and SUV taxis. 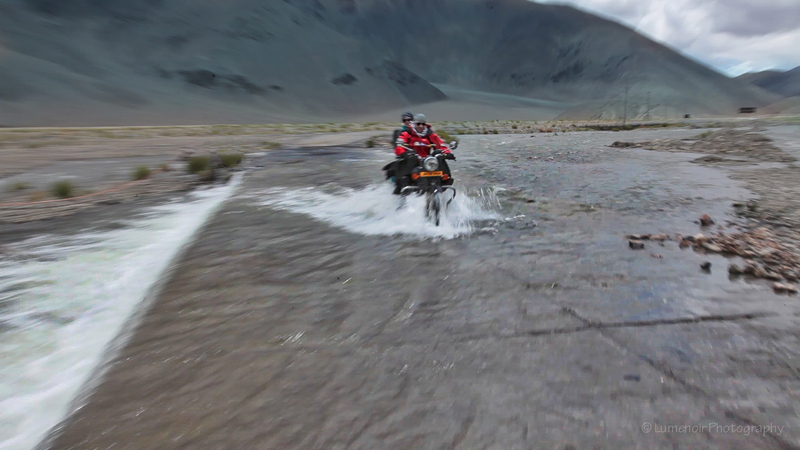 We quickly learned that the road to Manali was buried under a mudslide. The policeman that took a copy of our permit warned us to be on a lookout for bad roads because of weather and let us go. We took off to Nyoma where landscape changes from abrupt limestone vertical walls into tall dreamlike hills separated by sandy mini deserts. The road was in a desperate shape. 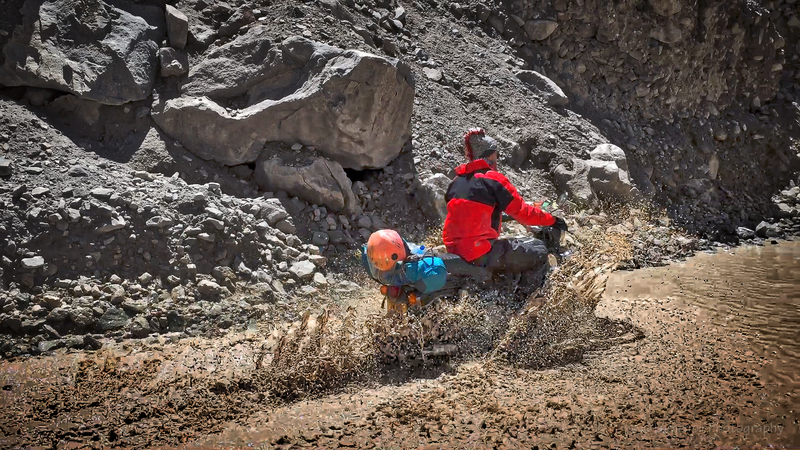 In many places covered in large pools of water and mud, it occasionally offered a stretch of a clean asphalt. Closer to Nyoma we crossed our first river running over the road to taste of what was yet to come. After a quick homemade chowmein lunch at Nyoma our run along the bank of Indus River swollen with muddy dark brown water came to a stop at a hand operated Schlagbaum juxtaposed to a booth manned by armed soldiers in camo garb. This is the place where our future course will be determined. We presented our documents with permits with relaxed anticipation. After taking a bundle of papers and our diverse colorful stack of passports to the booth an officer came out and asked one word “Where?”. None of soldiers spoke much English and we didn’t push them to speak with any questions. 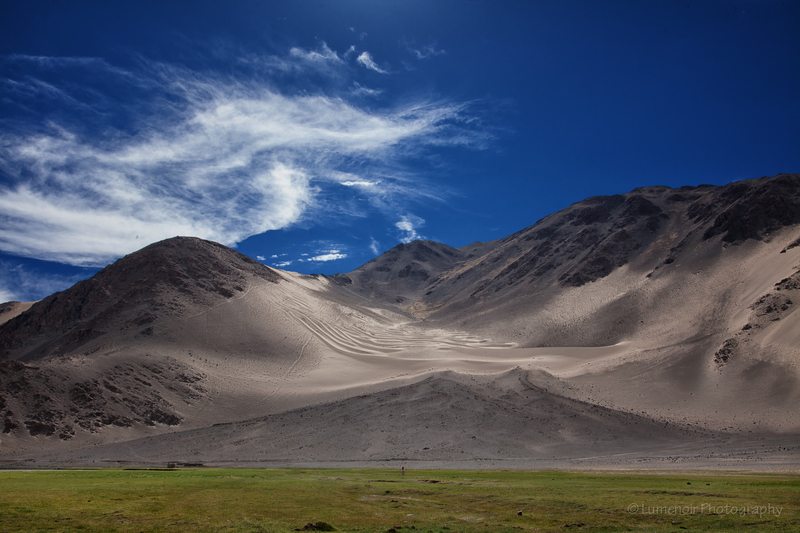 When a local Ladakhi man showed up, he explained in a good English that beyond the mountain to the North there was Tsaka village and we definitely should visit there. It was exactly what we needed, but it was crossing the restricted area. Soldiers seemingly felt relieved that they didn’t have to speak to us and after a second review of the documents officer signaled to the other to rise the turnpike and let us through. 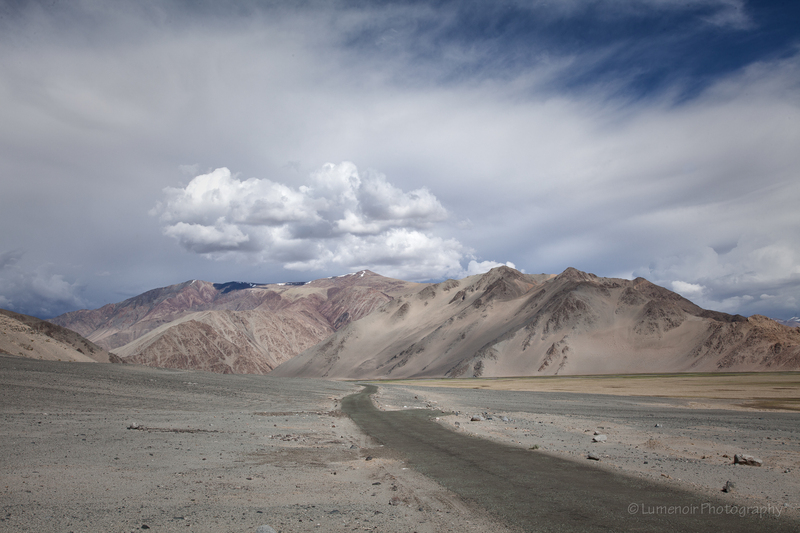 We held our breath and excitement until we were few hundred meters away – “Wow, we are going to Pangong!”. 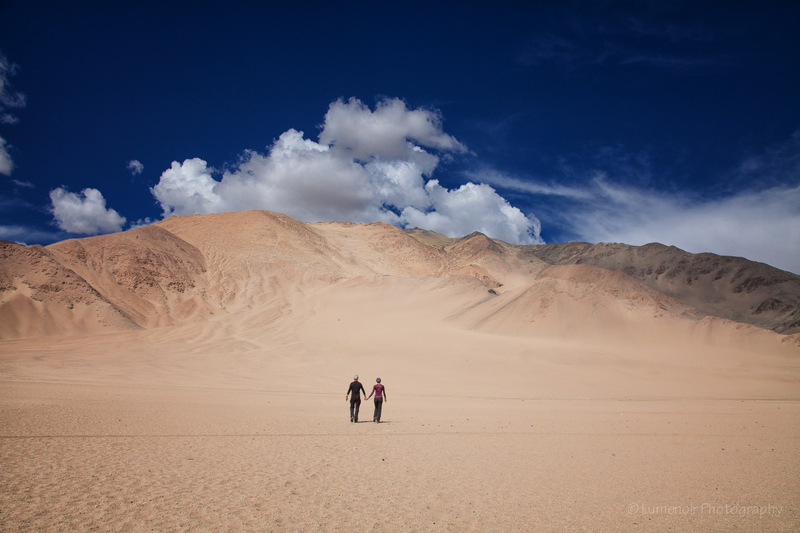 Perhaps less than thirty minutes later we entered a alley of white sand surrounded by vividly colorful mountains. Tsaka village must be somewhere close but no sight of it, the area is magically empty of any kind of human intervention besides the narrow road.